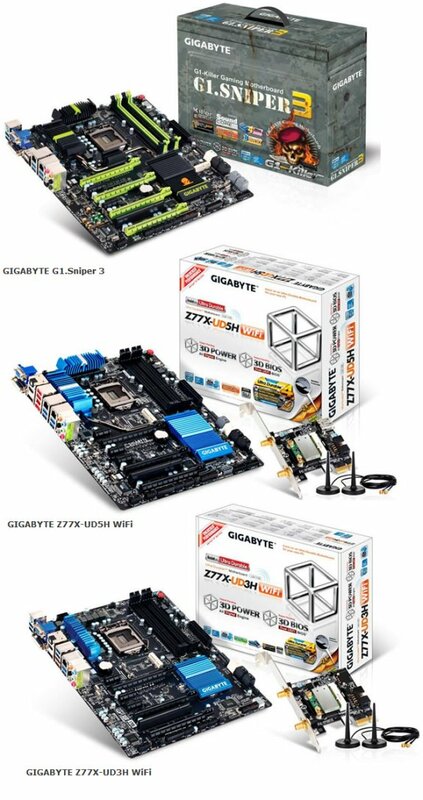 Gigabyte reveals its new 7-series motherboards at CeBIT. GIGABYTE TECHNOLOGY Co. Ltd., a leading manufacturer of motherboards and graphics cards is delighted to showcase its forthcoming 7 series motherboard designs supporting 3rd generation Intel® Core™ processors, showcasing a range of features including the new All Digital Engine, GIGABYTE 3D BIOS and GIGABYTE Ultra Durable™ 4 technology. Join GIGABYTE at CeBIT 2012 in Hall 15, D19 from March 6th through March 10th 2012. Visitors to CeBIT 2012 can have an exclusive look at motherboards that feature the latest All Digital Engine design for the PWM. Our new All Digital power design allows users greater control over the power delivered to their 3rd generation Intel® Core™ processors that use the LGA 1155 socket. Using entirely digital controllers for the CPU, processor graphics, VTT and system memory, users can enjoy more precise power delivery to the PC's energy sensitive components than previously possible. "GIGABYTE 7 series motherboards featuring a new digital PWM design and an updated version of our popular 3D BIOS are on schedule and will be globally available in volume at launch," commented Henry Kao, Vice President of GIGABYTE Motherboard Business Unit. "Our customers are very excited about making a swift transition to these 7 series motherboards and the benefits they offer in terms of features, performance and control." GIGABYTE will also be offering the chance to see for the first time in public, the updated look and feel of GIGABYTE's revolutionary 3D BIOS that is based on the exclusive GIGABYTE UEFI DualBIOS™ technology. 3D BIOS offers two distinct modes of interaction in a BIOS environment, 3D Mode and Advanced Mode, that re-draw the traditional BIOS user experience with a far more intuitive and graphical interface. GIGABYTE Ultra Durable™ 4 motherboards embrace a range of exclusive technologies that guarantee DIY PC builders the absolute best protection for their PC, with built-in features that prevent common malfunction threats including humidity and moisture, electro-static discharge, sudden power loss and high operating temperatures. Set Your Desktop Free: GIGABYTE Bluetooth 4.0/Dual Band 300Mbps Wi-Fi PCIe Card GIGABYTE 7 series motherboards will come with an exclusive PCIe expansion card that offers support for the latest Bluetooth 4.0 (Smart Ready) and dual band 300Mbps Wi-Fi connectivity*. With the growing availability of affordable or free remote PC operation software, such as Splashtop and VLC Remote, GIGABYTE believes that now is the time to explore and enjoy the home cloud: a personal cloud within the secure environment of a home network where the performance and functionality of desktop PCs can be utilized and controlled by portable cloud devices. GIGABYTE 7 series motherboards will feature an onboard mSATA connector* that, together with GIGABYTE's EZ Smart Response technology, allows users to simply and cost effectively enjoy better responsiveness from their PCs. mSATA solid state drives have been made popular by the rapid growth of tablet PCs, and provide a cheaper solution for smart caching because they are available in smaller capacities than traditional SSDs. Setting its sights on the small business market, GIGABYTE will demonstrate the B75M-D3H motherboard that represents a new product range with useful PC management features from both Intel® and GIGABYTE. These features allow system integrators to add value to their products by offering services to small businesses with between 1 and 99 PCs, where manageability, affordability and GIGABYTE’s Ultra Durable™ 4 design quality can lead to significant savings in time, cost and effort. GIGABYTE will also showcase a number of the latest motherboards that are designed to get the most from both AMD Fusion APUs and Bulldozer CPUs; these include the 990FXA-UD5, 970-UD3, A75-D3H and A75M-UD2H motherboards.